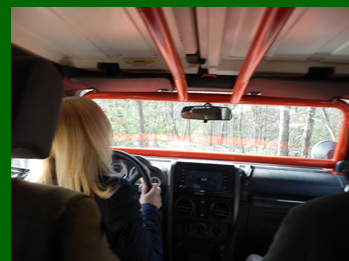 Over the river and through the woods...Off-Road Driving at The Greenbrier® - America's Resort in White Sulphur Springs, West Virginia in a Jeep Wrangler Rubicon; what a fantastically fun and wild ride for The Adventure Kids aka Debra C. Argen and Edward F. Nesta! 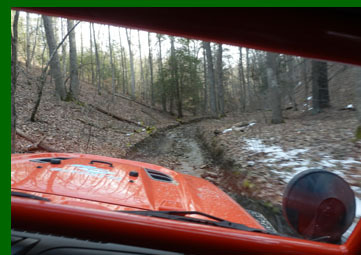 Off-road driving is a popular activity at The Greenbrier where they have 25 off-road trails over a 30-mile course to experience the mountains of West Virginia, and this was an adventure that had The Adventure Kids' aka Debra C. Argen and Edward F. Nesta, names all over it. The resort offers three different off-road driving experiences taught by one of their highly trained and experienced Off-Road Adventures guides: a 1-hour session, 2-hour session, or a 3-hour session. The 1-hour session is designed to teach the basics of off-road driving and is an introduction to an off-road driving experience. Only one guest has time to drive, however up to three guests can be in the vehicle to experience the ride. The 2-hour session offers the opportunity to learn more advanced techniques and skills, and up to three drivers can participate. The 3-hour session is similar to the 2-hour session with more drive time and learning more advanced skills. We opted for the 2-hour session which would allow both of us enough time to learn skills and techniques and provide us with ample drive time. Excited and ready to go, we climbed into the Jeep Wrangler Rubicon after we decided that Edward would be the first driver, and Debra would follow. 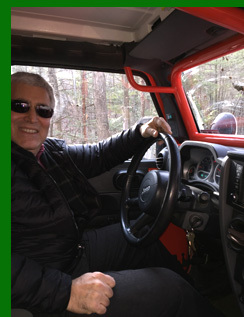 Our instructor, Joe, climbed in behind the wheel and we were off on a new adventure. The afternoon was sunny and the air crisp, and the terrain was perfect with muddy trails and water flowing freely from snow melting off the 30+ inches that hit the area the week before that would provide some off-road challenges. 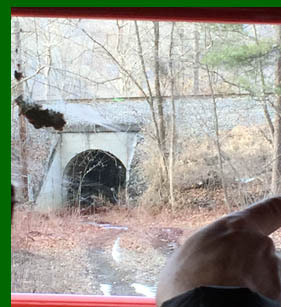 We started off with Joe behind the wheel cutting through under bridge passageways as he drove us to our destination to enter a new world of fun behind a steering wheel. 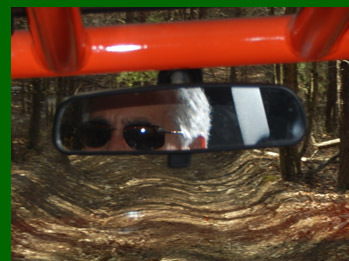 Edward: Over the years, I have raced shifter carts, Can-Ams, Formula Fords, open wheels, and sedans, and feel extremely comfortable behind the wheel of pretty much any type of vehicle so I was really looking forward to experiencing off-roading in a Jeep Wrangler Rubicon, a vehicle designed to meet and exceed extreme off-road challenges. After Joe provided a short discussion on how to use the automatic transmission to drop the engine into 1st or 2nd gear to descend or ascend a mountain trail and allow the vehicle to do its work by providing the right speed for the oversized tires to grip the terrain and take us for our off road experience, I put the Jeep in gear and was ready to begin. I easily grasped the technique of gearing and melding the vehicle to the course, and during my drive time, we traversed unpaved roads, up some challenging uphill paths, and some very steep downhill tracks and the Jeep stuck like glue to the course. Joe took us through an extremely tight course that provided me with the opportunity to build my course confidence as well as challenge me by driving over a deep trench with running water and with some great instructions that allowed me to navigate the Jeep up, over, and through the woods. It seemed like I was just getting started, when it was time to let Debra have her time behind the wheel. 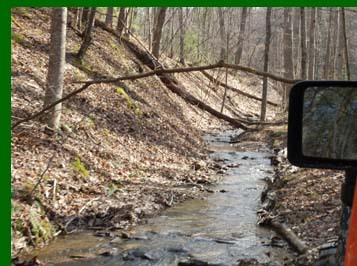 Debra: Sitting in the passenger seat while Edward drove gave me a different trail perspective and was definitely thrilling as he flew over the trails deftly avoiding bumps, stumps, and trees. It also provided me with the opportunity to listen and to learn before it was time for me to take my place behind the wheel of the Jeep. Although I was looking forward to my drive time, I was also a bit apprehensive as my driving experience to date has been limited to city and highway driving in a small car, and some very limited past experience off-roading in ATVs, not driving any vehicle as large as a Jeep Wrangler Rubicon, much less on steep, narrow, dirt and mud trails in the woods. However, as I am The Adventure Kid, when it was my time I jumped behind the wheel and was ready for the fun to begin. My adventure began easy enough, I put the vehicle into 1st and applied my foot to the gas pedal and proceeded, albeit at a very slow pace, on a straight ahead path to get the feel of the vehicle and the terrain. Okay I thought I can do this, which is exactly the moment that Joe told me that I needed to make a sharp turn onto a narrow trail. I grasped the wheel with white knuckles, completed the turn, and headed downhill on a very steep and narrow trail lined with trees on either side. Still breathing, and with my passengers not screaming out in terror at my driving skills, my confidence started building as Joe instructed and encouraged me along the steep terrain. Soon my trepidation passed, and I loved the experience and the thrill and the challenge of off-roading, confidently driving through streams, over rocks, and avoiding trees and other obstacles, while learning the vehicle's capabilities. I thought I was doing rather well until I encountered a deep rut and found myself in a slight tilt position with the top of the drivers' side door below the rim of the trail, and my heart started racing faster than the rpm of a race car as rolling the Jeep was definitely not something I wanted to experience, and I had the feeling that it was not something that my passengers wanted to experience either. Cool as a cucumber, Joe just laughed and coaxed me through the challenge, and when all four wheels were safely back on terra firma, I finally released my strong hold grip on the wheel and let my breath out. As they say, just as you start to get comfortable Mother Nature throws you a curve, and in my case my next challenge came in the form of being stuck in the mud on an uphill trail. Once again Joe guided me through the techniques of sharply turning the wheel back and forth while keeping my foot on the gas that would eventually allow me to free the tires from the mud and back it down the hill. Of course, it also involved spinning my wheels and throwing up mud all over what was a clean and shiny Jeep when we started, which is part of the fun, or so I am told. I also learned why you do not leave your window open during that technique as mud flew into the Jeep and hit me square in the side of my forehead. Thrilled, I felt like it was my badge of honor, I was now an experienced off-road driver, as I brushed it off without giving it another thought, although I did take a minute to close the window before continuing our adventure. Debra giving the Thumbs Up! 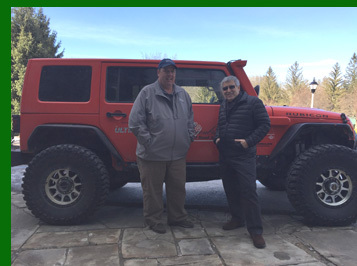 With more drive time remaining, I relinquished the steering wheel so that Edward could have another opportunity behind the wheel, and I could do more photography so we could share the experience of an exhilarating afternoon off-roading in a Jeep Wrangler Rubicon at The Greenbrier. Driving through woods one must be prepared for anything and our last challenge of the day involved a long fallen branch hanging across a trail blocking our way out. 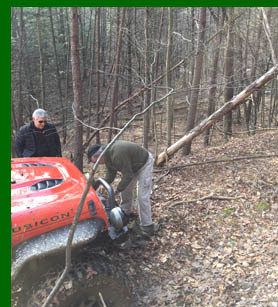 No worries, Joe wrapped a rope around the branch, secured the rope to the winch, got back in the vehicle, and put it into reverse. The branch fell cleanly, we pushed it to the side of the trail, and we were on our way back to the resort with our heads filled with exciting memories of our new adventure. Although this was our first off-road driving experience in a Jeep, it is an experience that we hope to do again in the very near future! Age Requirements: Minimum age to participate in driving is 16 years old with a valid driver's license. Passengers must be at least 13 years of age. Drivers and passengers under the age of 18 must have parental consent and be accompanied by and travel with an adult in the same vehicle. Dress Code: Resort casual attire, including sport shirts, walking shorts, and jeans. 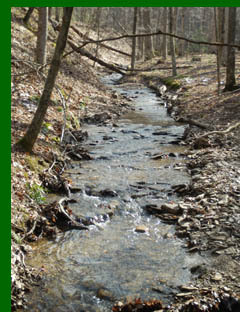 Please visit the website: Greenbrier Off Road Adventures for complete details on hours, rates, and additional information. Read more about our stay at The Greenbrier® - America's Resort in the Hotels and Resorts section, in the Restaurants section: The Forum and Prime 44 West at The Greenbrier - America's Resort, and read the interview and get recipes from Chef Meredith Flavin in the Chefs' Recipes section. By Amtrak (www.Amtrak.com): The White Sulphur Springs train station (WSS) is conveniently located next to The Greenbrier's Christmas Shop at The Depot! Amtrak offers regular train service to The Greenbrier from major cities including Washington, D.C., New York City and Chicago. Guests of The Greenbrier taking Amtrak to White Sulphur Springs can enjoy a 15% discount with promo code: V739. Amtrak also offers a comfortable Business Class car and a Sleeping Car on the Cardinal line.